ab6623 recognises a monocyte surface antigen of 55 kDa found chiefly on monocytes. UCHM1 was clustered at the Third International Workshop and Conference on Human Leucocyte Differentiation Antigens. Oxford 1986, as CDw14, group A. In tonsil tissue sections UCHM1 gives positive staining reactions with monocytic cells, the interfollicular tissue macrophages seen under the capsule, and dendritic reticulum cells. Skin Langerhans cells are always negative. UCHM1 also reacts with Kupffer cells and sinus lining cells on the liver. Our Abpromise guarantee covers the use of ab6623 in the following tested applications. ab6623 staining of human peripheral blood monocytes, visualised with rabbit anti-mouse IgG: FITC. ab6623 has not yet been referenced specifically in any publications. Publishing research using ab6623? Please let us know so that we can cite the reference in this datasheet. Can this antibody be used with paraffin sections or only frozen as stated on the datasheet? 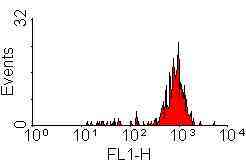 This antibody has been tested on paraffin sections and does not work. In IHC, it is known to work only with frozen sections.